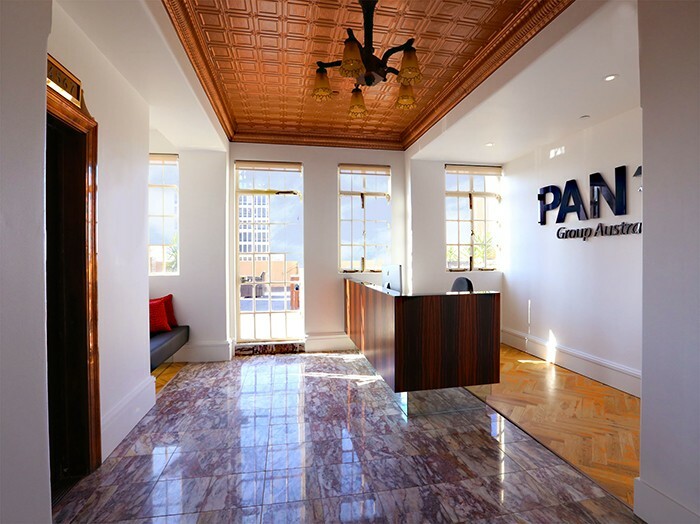 ODC Design’s team worked with Pan Group on refurbishments to their Melbourne office. The existing building was built in the 1920’s and its original features were used as inspiration for the design, which included high ceilings and French façade windows. The new layout involved splashes of bold colours scattered amongst the existing neutral tones of the interior, and the addition of modern light fittings and furniture creates a mix of contemporary with traditional design. The building’s heritage was echoed throughout, demonstrated with the use of similarly toned reception desk and flooring that were used to replicate the reception area’s existing vintage metal pan ceiling and internal lift door. Darker hued signage is showcased on the reception area’s wall. The boardroom and back of house areas were styled with minimalist furniture and light fittings to keep with the overall look and feel. The design increases space efficiency and provides Pan Group with a newly refreshed workplace for their staff.